Here's my thing: why would a label give me a digital download to an album that is only available with the DVD combo package? Such is the case with Sonata Arctica's Live in Finland. The audio (CD) recording is only available if you buy the DVD bonus package. If they're trying to promote the live video concert footage, then why not supply the DVD to the reviewer? No answer required, as this is common practice in the digital age. And it's difficult to fault them as this would be a rather expensive promotional adventure. Okay, so basically all I have to review is the audio, or soundtrack, to the DVD concert. It's still Sonata Arctica, and so, it's still good. I'm a fan, and have been for a long time. 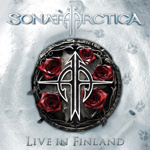 The soundtrack offers Sonata Arctica's creative metal musicianship in a live performance. They sound quite good. The conclusion here is obvious: Sonata Arctica sounds great. But since the primary format was to be a live concert on DVD, I can't give you much to work with. I suppose, if you're a fan, then you should gobble this up. That's it. Blame my better than average score on not having the concert DVD to review. What is there to say. This release is a DVD of a live concert in Finland. All I have is the audio soundtrack. Therefore, there is not enough info or context to make a sound judgment. But it does sound great.